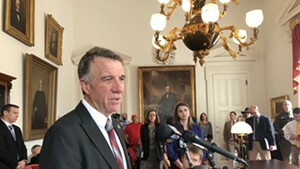 Facing a recalcitrant Vermont legislature, Republican Gov. 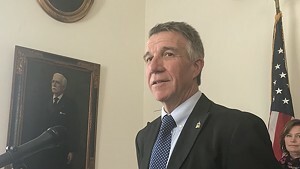 Phil Scott's administration issued a blistering press release Thursday that accuses lawmakers of fiscal irresponsibility and putting "partisan politics ahead of progress" — while also demanding that lawmakers adopt the governor's ideas for reducing the cost of public schools. At the same time, Senate leaders sent the governor a letter pleading for constructive action to avoid a veto session. The gubernatorial press release, issued Thursday evening and entitled, "The Lesson of Squandered Savings for Teachers, Taxpayers & Kids," was written by Scott communications director Rebecca Kelley. She began by castigating lawmakers for "failing to take full advantage of the opportunity to save $26 million each year" by negotiating teacher health care benefits on a statewide basis — a proposal Scott floated in April 2017, and which the legislature rejected. 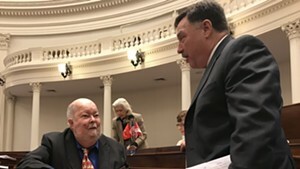 Kelley blamed a projected rise in teacher health care costs on lawmakers' failure to act last year, and noted that if the statewide negotiation plan had been adopted, the state could have reduced tax rates and invested more in early and higher education. She then urged lawmakers to approve a plan that has yet to be unveiled. "The Administration will be presenting a path forward early next week that simultaneously stabilizes education tax rates and increases educational opportunities for our children," she wrote. She asked the legislature to "work with us" to "find common ground," which seems a bit much when the administration is waiting until the last days of the session to finally reveal a far-reaching education funding plan. 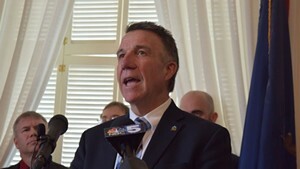 Especially when Kelley warns of dire consequences "if the legislative leaders treat the forthcoming proposal the way they treated the Governor’s statewide health plan." Which is not a call to compromise; it's more like "take it or leave it." In an ironic and/or unfortunate coincidence, four top state senators sent a letter to the administration Thursday asking the governor to engage with them to resolve the education funding issue. Senate President Pro Tempore Tim Ashe (D/P-Chittenden), Senate Appropriations Committee chair Jane Kitchel (D-Caledonia), Senate Education Committee chair Phil Baruth (D/P-Chittenden) and Senate Finance Committee chair Ann Cummings (D-Washington) all signed the letter, which Seven Days obtained from a source outside the Senate. 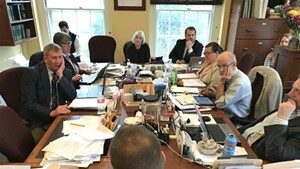 The four senators wrote that with a commitment from the administration to openly discuss "all possible solutions to fairly finance Vermont's schools," a reasonable agreement could be reached without the need for a veto. They asserted that "a veto session is simply not necessary to fund school budgets," and added, "the Administration could help avoid a veto by bringing forth its proposal even at this late date." 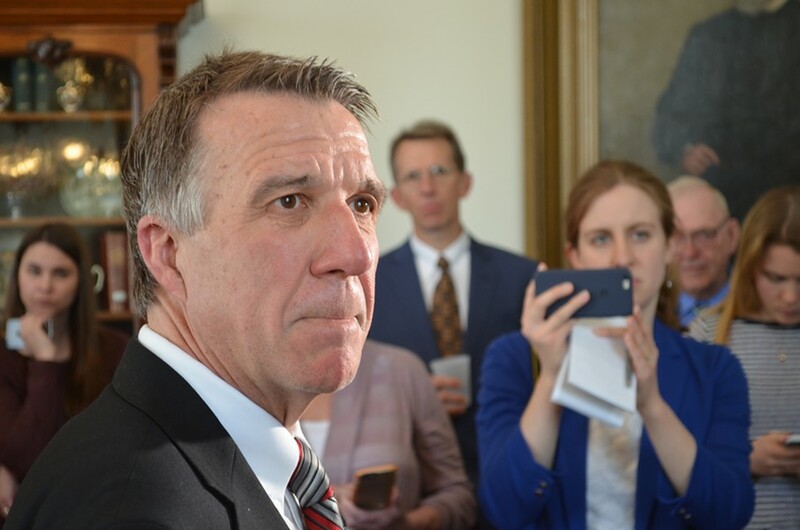 This dramatic difference in tone and message comes at the end of a week in which Scott administration officials did not distinguish themselves in bringing proposals to lawmakers. On Tuesday, Finance Commissioner Adam Greshin and Brad James, education finance manager for the Agency of Education, presented the House Education Committee with a plan to impose sanctions on school districts that exceeded the administration's targets for staff-to-student ratios. The two men acknowledged that the plan had been developed in a hurry and hadn't been "fully vetted," in Greshin's words. 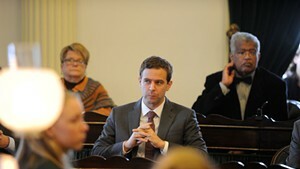 And the commissioner struggled to square the proposed penalties with Scott's blanket opposition to new taxes and fees. Two days later, Tax Commissioner Kaj Samsom appeared before the House Ways and Means Committee and refused to discuss the administration's plan to keep property tax rates level through the use of one-time funds — the plan that, according to Kelley, will be released sometime next week. He also declined to reveal further details of the plan that Greshin had floated on Tuesday. Committee chair Janet Ancel (D-Calais) reminded Samsom that "the clock is ticking" and that adjournment is only one or two weeks away. Committee members expressed frustration over the administration's failure to deliver a proposal until the last minute. Kelley's press release appears to be an attempt to refocus the narrative and shift blame onto the legislature. And while Senate leadership is proffering an olive branch, the administration seems to be wielding a blowtorch.